Expanded Clay Aggregate (ECA) BLOCKS are masonry units manufactured using Expanded Clay Aggregate (ECA), Class F fly ash and Cement. They are used for non-load bearing wall masonry. After application of a high-performance innovative technology of manufacturing and post curing process, Expanded Clay Aggregate (ECA) BLOCKS gains superior material properties. It also offers no reduced shrinkage and a superior fire and chemical resistance adding to several advantages including durability, versatility, speed and ease-of-use as well as cost benefits and environmental considerations. We often see customers having questions before finalizing the construction materials or while looking for lightweight concrete blocks suppliers. Common questions that come in mind during the selection of lightweight concrete blocks for their construction are how much does the concrete blocks cost? Or what is the size of a concrete building block? Are there any lightweight concrete blocks suppliers situated in their area? Or is there a difference between the cinder block and concrete block? Or is there a supplier with cheap concrete building blocks for sale? The long wait is over looking for the solid lightweight concrete blocks in India. The solutions to all are Expanded Clay Aggregate Solid Construction Block. For the 1st time in India, concrete building blocks are offered which are not only lightweight concrete blocks but are also falling in the premium segment of solid construction blocks. They are manufactured using Expanded Clay Aggregate. Expanded Clay Aggregate blocks are manufactured in India for the 1st time. They are also known as Leca blocks or lightweight expanded clay aggregate blocks worldwide. These Leca blocks or expanded clay aggregate solid construction blocks use a special type of expanded clay aggregate which is formed by firing the natural mining clay at 1200 °C in a rotary kiln. The result is a hard honeycomb structure of interconnecting voids. These concrete building blocks made of expanded clay aggregate enhances the internal curing and enhances the compressive strength to arise over time. 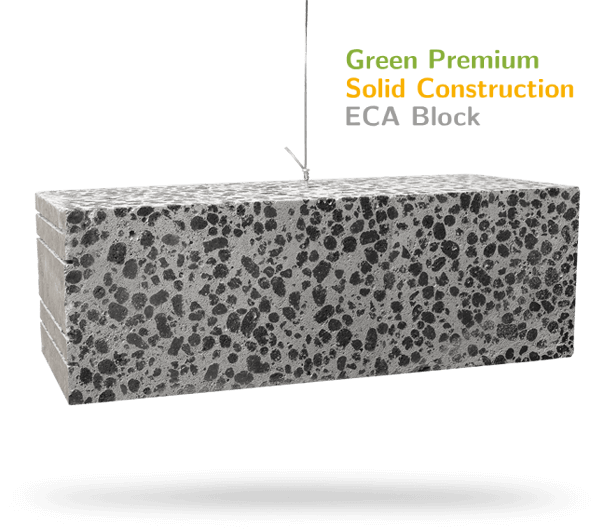 ECA blocks or Leca blocks manufactured in India are the best choice for construction which offers design flexibility combined with excellent thermal and acoustic properties. They are easy to nail, drill, shape and chip and unlike other conventional building blocks, they do not get the plaster cracks on them due to a strong bonding property with regular cement mortar.